It's been a really busy week here at the Manor and so I'm only just telling you about my swaps that I made for a team training event LAST WEEKEND! We get together as demonstrators regularly throughout the year and these are some of my favourite times that I always look forward to and come home with a head full of ideas. Last weekeng 60 of us got together for a training event which was basically a chance to craft together, laugh together and generally have lots of fun! My wonderful upline Michelle Last held this event and as usual it didn't disappoint. One of the "funnest" parts of these events is swapping something you have made with others, meaning that in return for you sharing your project, you get something back in return! Some of the events that I go to, the swap groups are huge and there are no guidelines so you can literally make anything! 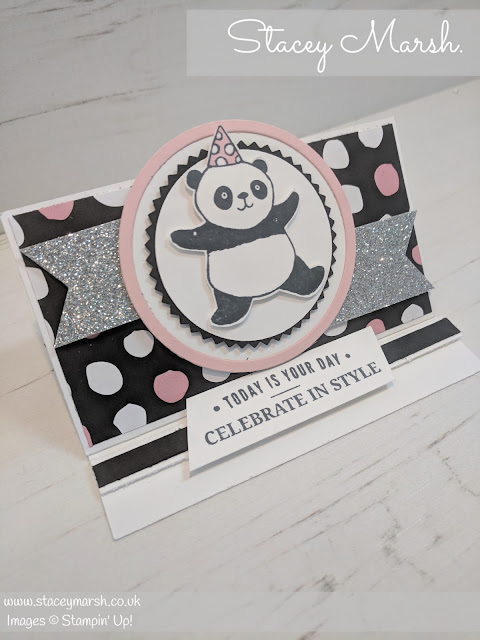 For this event, I joined 2 groups, for 1 I was tasked to make a card using the FREE Party Panda's Stamp Set, and for the other, I was tasked with making a 3D item. To make my life a little easier, I decided to make my 3D item also with the Party Panda's stamp set, and so when put together it looks a gift with matching card! Starting with the card, I made an easel stand card. 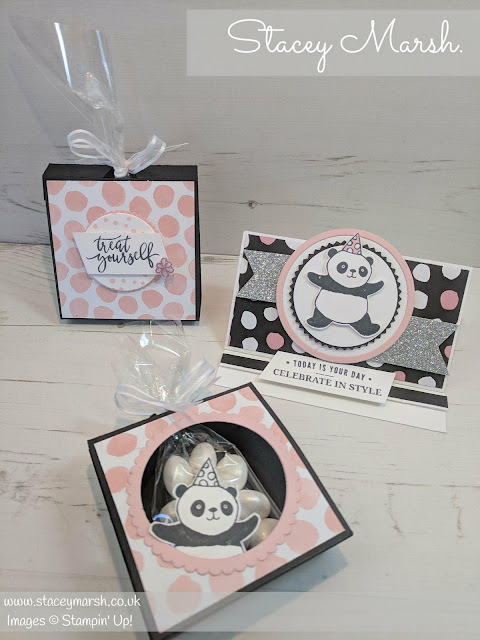 I used the Party Panda with some monochrome DSP from the Whole Lot of Lovely range coloured in randomly with a Pink Piroutee Stampin Blend to coordinate with the cardstock that I had used also. The Silver Glimmer Paper was added for a bit of sparkle. For the 3D item, I made a small treat holder using the 2" x 8" cellophane bags that I filled with mints. These could be used as place settings on a table, or small thank you gifts at a event. They were really simple to make using just a strip of cardstock, scored and folded. 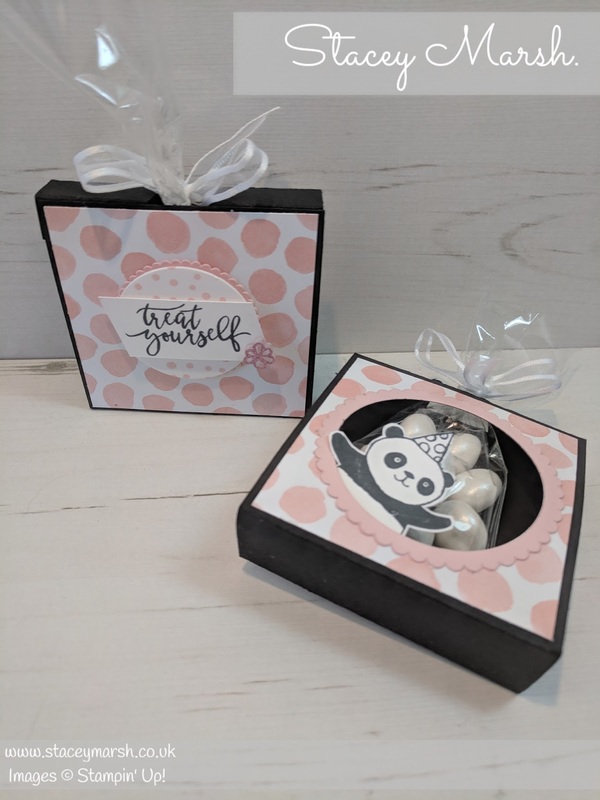 To decorate I used pink and white spotty DSP from the Whole Lot of Lovely range, and added a panda to match the card. Overall, I was really pleased with my swaps and I got some great items in return! Now to start thinking about my swaps for the next event in April where there will be approximately 600 demonstrators in one room! Have a great week everyone, I hope you stay warm in this cold weather that we are expecting!